The clinical team alongside the professional support staff includes nearly 40 specialists, making it one of the largest dental clinic in Tallinn. Our team includes reputable and experienced dental care specialists, who are also active as teachers in higher education institutions in Estonia (University of Tartu, Tallinn Health Care College). These are talented and ambitious young doctors. We pay special attention to the continuing professional development of our doctors, which means providing them with opportunities to attend additional training in Estonia as well as abroad. We also offer additional training for dentists and dental nurses ourselves, which gives us a chance to keep ourselves as well as others constantly evolving in the field. To achieve the best end result, the doctors at Nordic Dental Clinic work side by side with excellent dental technicians. We hope that the cozy atmosphere of our clinic, the friendly approach of our staff and the right balance of quality and pricing will guarantee our patients a stress free and pleasant dental care experience. The Nordic Dental Clinic uses the newest dental care equipment made by the world leading manufacturer Adec in the US. We also have all modern means for diagnostics at our disposal – digital x-ray devices, digital panorama x-ray machines, and a dental care microscope. Our doctors all use magnifying glasses in their work that have been made to order especially for dental care and that guarantee the best possible visibility. We work based on the principle that you can treat only what you can see! We believe that at Nordic Dental Clinic we offer the best price to quality ratio the customer. We are certainly not positioning ourselves among the least expensive on the market – our motto is that medicine is not a field where you should offer cheap solutions in order to win clients. Despite the fact that our clinics are equipped with the newest medical technology, that we have motivated doctors and support staff, and that we use only high quality materials, our service prices are still very competitive. The number of patients our clinic has, shows that we have gained the trust of our clients. The price list of our dental treatment services is available in our clinic as well as at Nordic Dental Clinic’s web page. However, the final treatment cost is decided based on the individual treatment plan made for the patient. In case of more expensive treatment procedures, it is possible to pay for the dental treatment services in instalments. We offer the service in cooperation with LHV Bank and the leasing interest rate is 0% in the first year! 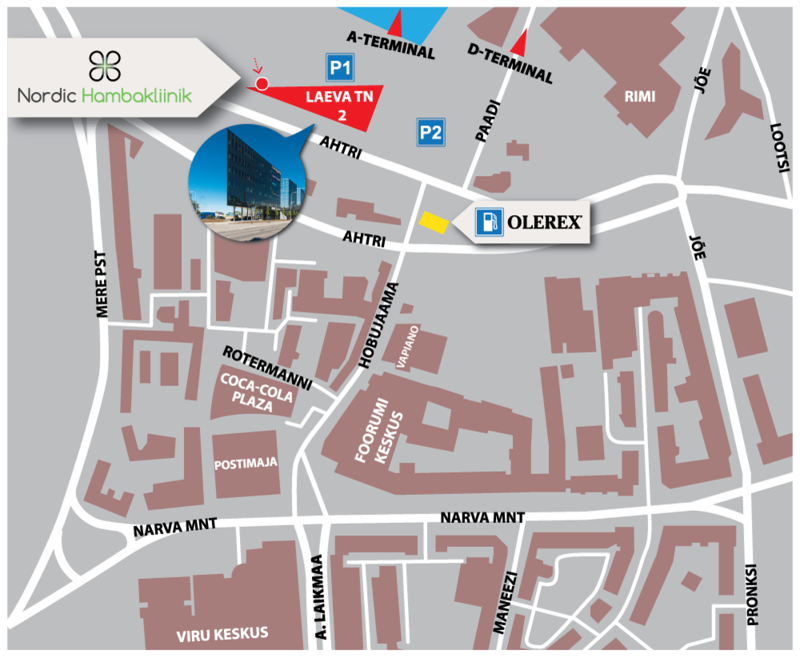 Nordic Dental Clinic Rotermann is located in the Navigator commercial and office building by the Port of Tallinn, Laeva 2, on the 5th floor (elevator B). Phone number 6 23 23 02. P1: Free parking, please validate parking with the Nordic Dental Clinic administrator. P2: Europark paid parking, zone EP42 (2€ per day).